Fantastic talk by Bill Gates at Techonomy. In it, he discusses his views on energy resources, education, combatting infectious diseases and the impact that technology has had on their economic models. It’s not quite reinventing capitalism, as the name of the video suggests, but it is fascinating to hear Gates’ views on his work after Microsoft. It looks like Gmail are starting to roll out the priority email feature, which uses an algorithm based on your preferences, user behaviour and keywords to prioritise your important emails over others. This could potentially be a real time saver for heavy Gmail users, and if it is anything like as good as the spam filter, this feature will surely be a hit. Also, hats off to the Google team producing these videos. Lately at work, I have been exploring the idea of a Bottom-Up Information Architecture methodology for web design. Traditionally, I have taken more of a Top-Down approach, whereby I begin the wireframing process with the navigation and homepage layout, before progressing down the sitemap through landing pages, individual content pages etc. Meanwhile, individual components such as registration forms, search and social media widgets would be designed as and when relevant to the page I am working on. The obvious benefits of this approach are that you can quickly get an understanding of the system in its entirety, and whole webpages can be tested early and in context. A bottom-up methodology would take the opposite approach, whereby the emphasis is instead placed on designing and testing specific individual components separately, before they are eventually brought together into the final page layout. The potential of this approach would be a more robust overall system built around core functionality, thereby affording key user tasks more extensive attention wherever they are situated within the website. This approach fits into the growing importance of lower tiered pages relative to the homepage. The bottom-up approach has traditionally been adopted in areas such as software design, management and state organisation (see Wikipedia article). Another interesting application is detailed by Richard Feynman in his section of the Report of the Presidential Commission on the Space Shuttle Challenger Accident in 1986. In this report, Feynman details how NASA had originally engineered their space shuttles using a bottom-up or “component system”, thereby insuring a rigorously designed and tested space shuttle system. In the case of the ill feted Challenger, a top-down engineering approach had been taken. A further disadvantage of the top-down method is that, if an understanding of a fault is obtained, a simple fix, such as a new shape for the turbine housing, may be impossible to implement without a redesign of the entire engine. Such lessons could also be applied to web design, where components such as forms, social media widgets or video players are designed individually without the constraint of having to fit within predefined column structures or a position on a page. For a typical website information architecture project, once the user flows have been created and key user tasks identified, the first stage of wireframing should focus specifically on the mini-systems to be built to satisfy these individual tasks. Designing these mechanisms individually and out of context can help create better usability and allow for speedy testing of these features. Usability issues are identified early and will have little knock-on effect for the rest of the site. Once all these individual subsystems have been created, we can begin to link them together to create larger subsystems. Eventually a top-level system is formed, with multiple complex links and interconnections between the individual components. The layout, navigation and general page furniture are then constructed AROUND and FOR these systems. This approach, which I admit is still only a theory, does raise its own questions. Does such an approach increase the likelihood that the designer will miss the big picture or the overall context of the site? 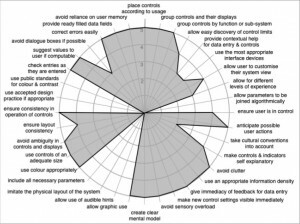 Testing individual components is great, but would this lead to a delay in testing the experience as a whole? And do we run a risk by not presenting the client with the big picture early in the project? My initial impression is that these problems can be overcome as long as the user journey and sitemaps have been thought out properly. Testing individual components may uncover the main issues early in the project, meaning the test of the system as a whole, even though it may be late in the day, is likely to only uncover issues in page layout and not problems with the more complex mechanisms themselves. Client expectations can be managed, perhaps most suitably in an agile working environment for a case like this. If any anyone has ever had any experience in designing this way, or if you have any thoughts please leave a comment or email me. Until then, I may just give this a go on my next project. Although not without its shortcomings, the iPad is a fantastic media consumption device and looks set to revolutionise the way that we use the web. From the point of view of a web professional, I approached the arrival of the iPad with an open and critical eye as best I could. Although some may have mistaken my previous post as the gushings of an over eager Apple fan girl, and despite not having laid my eyes on a real life iPad up to that point, I nevertheless believed that the iPad represented a paradigm shift in the way people interact with the web and other forms of media. Now that that I have finally laid my hands on one, I can safely say that although it is by no means a perfect device, the arrival of the iPad is significant. I cannot understate how good the multi-touch interface is on this device. As an user experience designer, I have a passing interest in usability, and Apple’s implementation of multi-touch on the large screen is fantastic. Zooming in and out of webpages, scrolling, using the shift key on the onscreen keyboard and panning around in Google Street View are all slick and naturally responsive. Apple have worked very hard on this and even the Nexus One cannot compare to the iPhone in terms of the interface’s precision and attention to detail. The iPad takes this to another level, perhaps not so much due to any major advances in the design or development of the interface, but by simply applying multi-touch to larger screen. Just a bigger iPod Touch? It is a joy to use. Over the last few months, plenty of naysayers and enthusiasts alike have had their say on the iPad, without having actually laid their hands on one. I include myself in this. Steve Jobs is a brilliant marketer of products (see video above. lol) and what he said about the iPad during it’s launch back in January must always be taken with a pinch of salt (best ever web browsing experience? Without Flash? Pfft), but one thing he said does ring true; it is like holding the web in the palm of your hands. For technology enthusiasts or for people with money to burn, I would highly recommend buying an iPad as an addition to your normal computer and smart phone. For content creation, it’s not quite there yet. For content consumption, there are few competing devices that offer such a smooth user experience and the iPad offers a tantalising glimpse at the future of computing. For everyone else, it would probably be best to wait a while. The next version of the iPad or the multitude of copycat devices that are on the verge of being released may offer you more choice, a competitive price and maybe that elusive web cam, Flash support and multi-tasking feature that you crave. Apple fan girls, you’ll love it. Sceptics, give it a try at least. 4 thumbs up! *Update* my flat mate’s mum just had a go on the iPad and she hates it. Here is an extremely interesting video by BERG and the Swedish publisher Bonier R&D that discusses the UX design challenges that are being presented to us by the wave of upcoming tablet devices. Whether the iPad is successful or not I believe that tablet computing devices are going to be hugely popular over the upcoming months and years (see a previous post on the Apple iPad). The task facing UX designers is to come up with new methods of interacting with content using multitouch gestures. The concept of “heating up” and radial menus are particularly interesting in this video. Enjoy! What’s the point of having a blog if you can’t indulge in posting funny YouTube videos? First up, I love Apple. I do have issues with the company, but overall I am a fan and I do own several Apple products. Despite this, as Apple presented the world with their newest device, the iPad, I approached it with suspicion and skepticism as best I could. However, even though there has been a large degree of backlash and cries of hype from the online community and even though I have yet to test this bad boy for myself, I have to say that I am sold. And I do believe that the introduction of the iPad is going to have a significant impact on user interface design and human-computer interaction (HCI) for years to come. As significant an impact as the mouse perhaps, which it may soon render obsolete. There has been a lot of skepticism before the announcement last Wednesday. Many companies, Apple included, have already tried their hand at a tablet PC. 10 years ago, Bill Gates was convinced that we would all be walking around with them. It looks like he might have been right all along, albeit a decade later and with help of the Steve Jobs Midas touch. The way it is being pitched, the iPad is a new category of mobile device. Sitting in between the iPhone and Macbook, the iPad is a mobile device aimed at offering a new and better way of browsing the internet, sending emails, viewing photos, watching videos, listening to music, playing games and reading ebooks. From what I have read, this has been a pet project of Steve Jobs for many years now, and it seems that he believes that we are all now ready for such a device. There are many things that the iPad lacks. Still no Flash support to annoy Adobe. No camera because who really uses it. No multi-tasking to save on battery (which seems to have pissed off Hitler to no end). No OLED to save on costs. These are valid concerns for many and perhaps we will see them introduced in future iterations of the device. Despite this, what we have been presented with is a new method of human computer interaction, a paradigm shift in user interface. Multi-touch, which began life on the iPhone, has found its new home and heralds the beginning of the end for the traditional point and click system and the “desktop interface metaphor” for computer operating systems. The trigger to make this possible was Apple’s introduction of multi-touch technology on the iPhone in 2007. Science fiction has constantly teased us with fantastic user interfaces that have impressed (e.g. Minority Report’s gesture user interface). What Apple has achieved, is to present us with a new fantastic user interface, without it being too fantastic. 75 million iPhones and iPod Touches have been sold to date, which for many of us makes the transition of moving to a multi-touch tablet device almost seemless. This product is not for geeks. Regular consumers will start using this immediately because for many it will already seem natural to them. It’s the perfect computer for your grandmother or for your one year old! What the iPad does is to provide a new norm for HCI. The metaphor of the Desktop Operating System was originally developed to make the interface of a personal computer more accessible to its core audience – namely office workers. The filing cabinet is used to access your documents and folders, all your icons were organised on your desktop and deleting files would move it to the trash can. However, as computers were popularised and grew in complexity and as the audience diversified, the desktop metaphor has become obsolete and actually works to hinder our understanding of a computer interface. Installing programs and plugging in devices can prove a chore and can sometimes be an absolute nightmare. In fact I would argue that the desktop metaphor no longer holds any meaning for digital natives, who have grown up unfamiliar with a world before broadband internet. The way they use computers has been defined by their interactions with services such as Facebook and YouTube, with tools such as Google and Wikipedia and devices such as the iPod Touch as demonstrated by the video above. But on the iPad, the process of finding, buying and downloading apps to conduct specific tasks will be second nature to many, because they are already so familiar with the process. This model has become so successful, that other companies have scrambled to launch their own app stores. Stores now exist for your Nintendo DSi, Android mobiles, Tv sets and your car. In my mind, the iPad will undoubtedly be a success when it launches in a couple of months. In the long term, its influence will be seen in the numerous copycat devices that will undoubtedly be popping up over the next few years. New upcoming technologies will be scrambling to implement a form of multi-touch interface because it is the new norm. If it isn’t the norm now, the attractiveness and affordability of the iPad will soon ensure its ubiquity. In two years time, you will see every student with one of these devices. The iPad is a next generation device and it is significant. Great news this week as it was announced that the government will now be publishing the world’s biggest set of public data at http://www.data.gov.uk. Data, such as location of post boxes, traffic accidents and flu outbreaks is now available to anyone who wants it. After the liberation of this data, what we will see now in the liberation of the information – through crowdsourcing. Some government officials were hesitant at first to release this data, especially for free. What Sir Tim Berners Lee and Prof Nigel Shadbolt managed to do, was convince them of the benefit, citing an example of how releasing data on bike traffic accidents in a post on the direct.gov allowed a group of developers to post a google mash up of the data within 48 hours. The real value is going to come from allowing people of different expertise and backgrounds to use the data to create outcomes that would not have been conceived by the people who collected them. Tapping into the diversity of the crowd will uncover new observations, realtionships and produce useful tools for individuals and business. This will cause a real shift in the way we view ourselves and the places that we live in. Tim Berners Lee also believes that it will herald a new relationship between the government and the people. Now that the data is out there, we will be able to hold public services accountable to a degree that was not possible before. It will be a new era of transparency. Lee also thinks it will be of great benefit to businesses. Even on a simple level like finding out where the nearest post box is, the information that we now have at our fingertips is going to prove extremely valuable. Expect to see a lot more tools and interesting mashups be released in the near future. Well, not exactly cheap, but cheaper. Following on from my posts about the “Digitisation of Manufacturing,” HP have announced a consumer level 3-D printer. More can be read in this article from Wired. You can see one in action here. 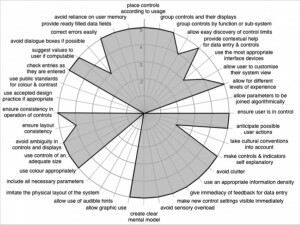 To me, these plots seem like an extremely useful tool for producing quick visual assessments of usability tests with a lot of complex parameters and allows for a relatively easy comparison between 2 or more sets of results. The list of testing parameters such as “appropriate use of colour” and “avoid clutter” are displayed around the edges of the graph with the corresponding value of 0 – 5 being plotted within the circle. This results in the production of a relatively arbitrary shape, although as long as the parameters are identical between tests, a comparison can be made. McCalden himself suggests further possible improvements such as grouping parameters together. In the case of web design, parameters could include “aesthetics,” “structure” or “ease of use.” Perhaps some colour co-ordination could help make the assessments quicker.